All 24 episodes from the third season of the spin-off crime drama starring Scott Bakula and Lucas Black. 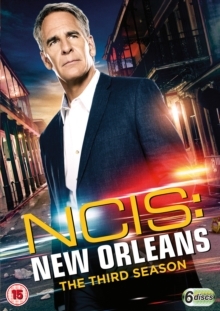 In the Crescent City, Special Agent Dwayne Cassius Pride (Bakula) heads up a team of agents for the Naval Criminal Investigative Service as they investigate crimes involving the US Navy and Marine Corps. The episodes are: 'Aftershocks', 'Suspicious Minds', 'Man On Fire', 'Escape Plan', 'Course Correction', 'One Good Man', 'Outlaws', 'Music to My Ears', 'Overdrive', 'Follow the Money', 'Let It Ride', 'Hell On the High Water', 'Return of the King', 'Pandora's Box: Part II', 'End of the Line', 'The Last Stand', 'Swift, Silent, Deadly', 'Slay the Dragon', 'Quid Pro Quo', 'NOLA Confidential', 'Krewe', 'Knockout', 'Down the Rabbit Hole' and 'Poetic Justice'.